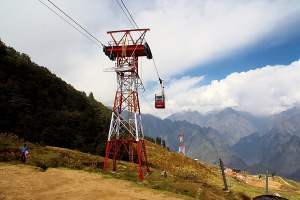 At a distance of 22km, Rishikesh is connected by a good road from Haridwar and the journey time from there or Dehradun is generally one hour. From Haridwar, shared taxis (known locally as Vikram) are available, which charge Rs25 to drop you at Rishikesh. However, if you pay an extra Rs5, you can alight at Lakshman Jhoola, the suspension bridge over the river Ganga (known as "Ganges"). Prepaid taxi from stand outside is more comfortable and costs R700s, but only R450s the other way. A vikram costs between R250-300s. Rishikesh (station code RKSH) is connected by the Indian railway network - the Hemkunt Express connects Rishikesh to Jammu Tawi and there are passenger trains between Haridwar and Rishikesh, one of which connects Delhi and Rishikesh. 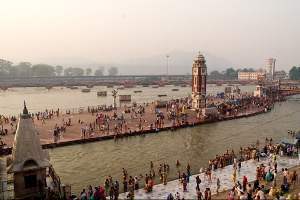 Haridwar is well connected by trains from Delhi and other parts of the country. After reaching Haridwar, a Vikram can be hired to take you to Rishikesh. 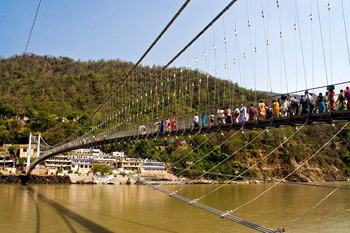 This is the old suspension bridge over the Ganga and is located at the far end of Rishikesh town. 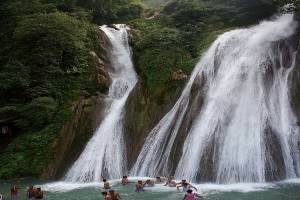 It attracts more crowds than Ram Jhula, which is another new bridge close to Rishikesh town. The approach to Lakshman Jhula passes through many restaurants and shops, which sell anything from trekking bags, tee-shirts, rudrakha, and spotik malas (garlands of precious stones). Ask your driver to drop you close to the bridge because the road has some steep ascending and descending steps. 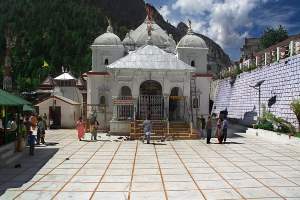 On the other side of Lakshman Jhula is Gita Bhavan (a museum for puranic and mythological awareness), temples and many ashrams. You can take a boat ride and return to the bridge, then walk over it for a long stroll on the other side. Wider than Lakshman Jhula, on one side of this bridge are nice restaurants, one of which is the Chotiwala ( now there are two resturants by two brothers ) - one of two famed eateries established in 1958 by the late Krishan Swroop Agarwal and his brother Har Swroop Agarwal. 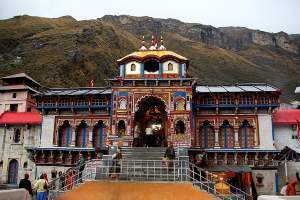 On the other side of Ram Jhula is Gita Bhavan (a museum for puranic and mythological awareness), temples and many ashrams.Cross the bridge and you can return by boat to the main bank of the Ganga. One of the attractions at Rishikesh is the Ganga Aarti, the evening prayer by the side of the famous river, which is performed at Parmarth Niketan ghat near Ram Jhula. Cross over from Ram Jhula and move along the river bank for about half a kilometre (follow the direction of the water flow). On this side of the river bank, near Ram Jhula, is the famous Choti Bala restaurant, easily located because of its beautiful marble flooring. 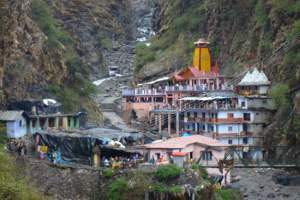 Close to the river bank is a statue of Lord Shiva. Remove your shoes and leave them at the free stand, then take your seat on one of the steps. Before the Aarti, some devotional songs are sung by devotees of the Parmarth group. Following this, the Aarti is performed, then the singing program continues. The songs and music charge the atmosphere with spiritual feelings. Rishikesh is famous as a yoga and meditation center. Many ashrams and schools offering courses, and camps on these subjects are available by the side of the river Ganga. Ganges from Dev Prayag to Rishikesh.....on what a sight....to have a dip here is a unique experience and for sure, one needs enough of good Karma. it becomes more sublime as it passes Sivananda Ashram, Muni-ki-Reti. I have been a regular visitor since childhood and certainly miss those wonderful pyaoo (water points) which used to be put by 108 Kali Kamliwalla.